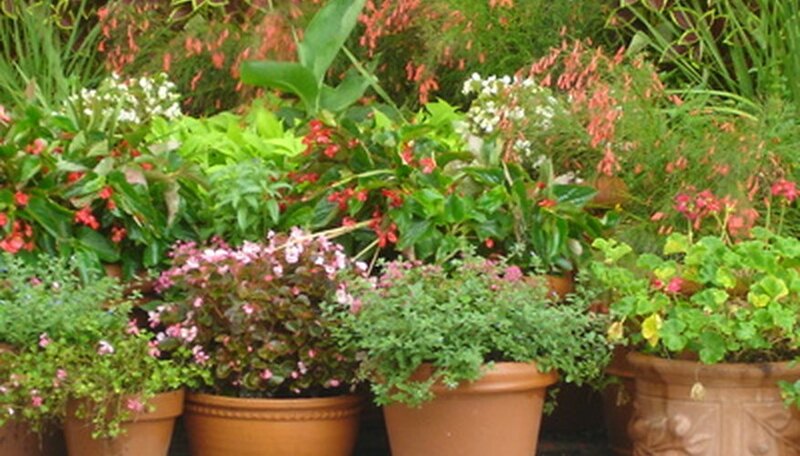 Growing flowers in pots in Phoenix is one way to add a lush colorful look to the landscape without wasting water. The pots add color to the garden as well as through the pot's different glazes, ceramic finishes and paints. Pots on patios, pools, decks and balconies bring the flowers up close. It's easy to move the pots around, change out the flowers and protect them from the hot summer sun. Pre chilled bulbs such as daffodils, tulips and hyacinths bring a breath of spring to Phoenix. Plant them in November or December about six inches below the top of the pot. Fill with soil and then carry out the spring theme with pansies, snapdragons and lobelia. Geraniums come in pinks, reds and white and do very well in pots. Combine them with alyssum and candytuft. Petunias come in white, blue, purple, red, pink and yellow as well as single and double flowers and frilled. It trails and is great for hanging baskets. Flowers in spring handle full sun in Phoenix. Summer is a challenge for gardeners in Phoenix. Temperatures reach over 100 degrees nearly every day from June through August and sometimes well into September. Water pots every day. Bigger pots dry out more slowly than small pots, which is a good thing in the desert. A coffee filter placed over the drainage hole slows down the water loss and keeps the pots moister longer. Flowers for summer include zinnias of all sizes from the tiny Thumbelina variety to the dahlia flowered types 36 inches high. Marigolds work well as does lantana. Cut back salvia when it starts to look water stressed and it should quickly revive and put out new growth. Moss roses or portulaca will keep blooming all summer long. Flowers should be protected from afternoon sun to live through the summer. Temperatures cool a bit but days of 100 degrees are not unusual in October. It's still necessary to check the pots every day to see if they need water. With the shorter autumn days, move the pots to where they receive at least six hours of direct sunlight a day to bloom. Traditional fall flowers look beautiful in pots such as chrysanthemums and asters. Complement them with Mexican heather, coreopsis and purple potato vine. Plant flowers that like cooler temperatures such as nasturtium, sweet peas, annual stock and calendulas. Begonias and impatiens do well in hanging baskets as does trailing geranium sometimes called ivy geranium. Flowering kale which isn't a flower at all but a frilled and colored plant from the cabbage family does well in pots. Roses, miniature and standards, will do well in pots.